As temperatures are starting to get warmer in early spring, honey bee activity will begin to increase. Colonies are building up their numbers after the long winter to prepare for spring nectar flows. In some cases, this can happen fairly rapidly, and hives can become overcrowded. This may result in a phenomenon called “swarming”. Swarm Season can start as early as March, and can run all the way through July. Swarming is part of the normal life cycle of honey bees, but Bee Keepers can take proactive steps to manage populations in order to avoid swarming. If it happens nonetheless, the queen will take off with about half of the colony’s workers, and they will fly away in a big cloud of bees. The swarm will settle down within a few hundred yards of the old hive, and send out scouts to scope out a new location for the colony. 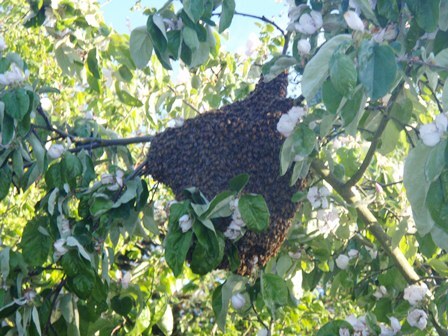 If you find a swarm cluster on your property, please do not attempt to kill the bees. 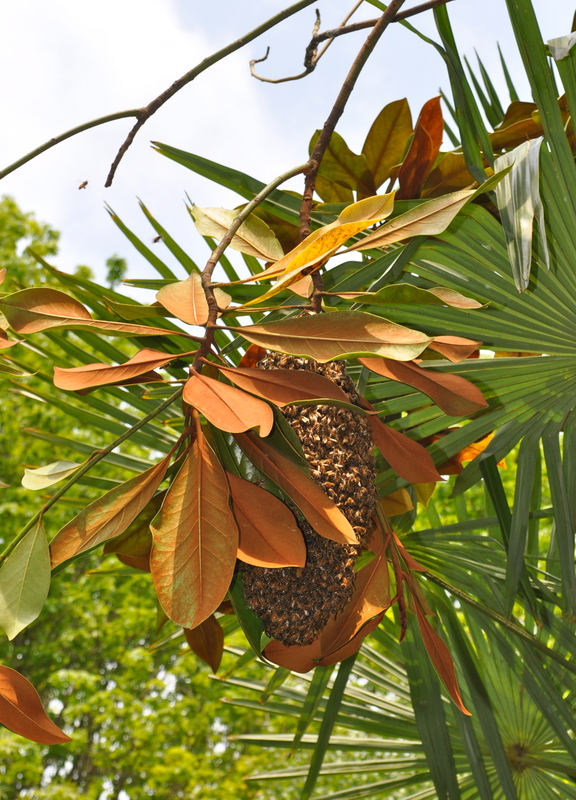 You may find a cluster of bees hanging from a tree branch, the eave of a house, or in a bush. The cluster may stay at that location for as little as 20 minutes, or as long as a couple of days. Honey Bees pollinate nearly half of all food we eat, they are an important part of the agriculture life cycle. While they are in their cluster, they are typically very docile. 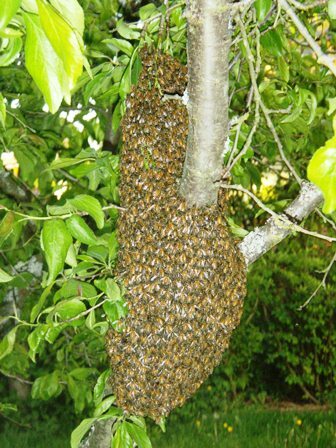 The risk of getting stung is fairly low, as long as you do not touch or otherwise disturb the cluster. It is important to point out that the cluster will not remain permanently in the tree or location where you find them. They will eventually take off to relocate into a new confined space to start a new hive, but if you would like them removed sooner than that, please contact a local Bee Keeper. If you live in the Greater Seattle Area, the Puget Sound Beekeepers Association maintains a “Swarm List“. The list provides contact information for Bee Keepers willing to remove honey bee swarms free of charge in Seattle, Bellevue and the greater Puget Sound area.